Today the US Senate confirmed Betsy DeVos as the new Secretary of Education. Many educational experts, teachers, and parents believe, with good reasons, that DeVos represents a serious threat to the future of American public education, and, therefore, a threat to American public school music. Indeed, anyone who is afraid for the future of music education should do everything possible to RESIST. Public education is a matter of fundamental human and civil rights. We must find the energy to protest and be more proactive than ever! We must keep hope alive for our students, colleagues, and our profession. Additionally, we must become more informed about daily and long-term efforts on behalf of public education. For example, subscribe to Diane Ravitch’s blog. Join and follow the Badass Teachers Association on Facebook. Join forces with The Network for Public Education (NPE). Follow Truthout for penetrating discussions of why and what is happening. We’re not alone! See and follow the NPE site for answers. Don’t let DeVos win this fight. Protest her agenda. As music educators, we need to think about our short-term and long-term aims. In the short-term, securing the place of music in public education depends on being able to understand, articulate, and affirm to ourselves and others that MUSICS matter. Many national sources exist to help us. 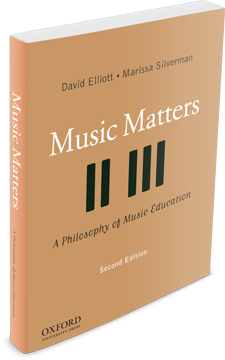 One international source, which may be unfamiliar to US music educators, is here. The future depends on making music education more musical, socially relevant, inclusive, welcoming, caring, ethical, creative, and “respecting and valuing multiple styles of learning and multiple ways of knowing.” We must continue to explore ways to make all forms of music making and listening, at all levels, more achievable, accessible, and applicable to all students. In the long-term, we need to mobilize everyone—students, parents, colleagues, administrators, community members, politicians…EVERYONE—to support the many ways public schooling can contribute to the full human flourishing of every student. This spring, once again, Diane Ravitch nailed the spirit of our education age. Addressing the Network for Public Education (NPE) conference, Ravitch came with an uplifting message. Corporate reform has failed. A new era of school improvement is dawning. Many of its leaders come from today’s youth. They are the new “Greatest Generation.” Today’s young people, having endured the brunt of test, sort, and punish, are not going to silently take it any longer. They demand schools worthy of our democracy.